Massimo Cellino can complete his takeover of Leeds United after winning an appeal against the Football League's decision to block the move. The Italian's Eleonora Sports company had agreed to buy a 75% stake in the club from Gulf Finance House Capital. Last week Cellino, 57, was disqualified from owning the Championship side after failing the Football League's owners' and directors' test. But an independent QC has overturned the original decision. 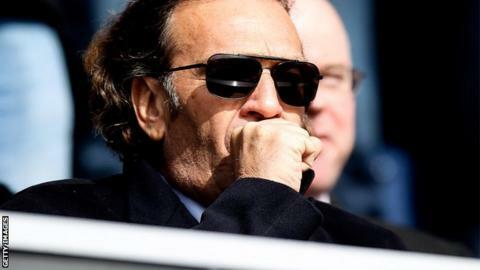 Cellino, who owns Serie A side Cagliari, was initially denied the opportunity to purchase Leeds by the Football League after being found guilty in March of not paying import duty on a yacht in Italy. "It is an honour for me to come to England - and in particular Leeds - where the sense of justice has been demonstrated," said Cellino. "Now it is my responsibility to follow my commitment up with deeds." Business: Agricultural entrepreneur known as the "King of Corn"
He recently stopped funding the club while the legal process was ongoing and must now start funding them again to avoid being in breach of the share purchase agreement, BBC Radio Leeds reports. In a statement, the Football League said: "We are disappointed at the outcome of the appeal hearing. "This was never about individual personalities, but instead was a matter in which we were obliged to uphold the integrity of our regulations having considered the issue in detail with our advisors. "It was always an extremely complex matter in which a different interpretation of a judgment made under Italian law could lead to an entirely different outcome in the context of our regulations. Ultimately this has proven to be the case. "The independent QC has concluded that Mr Cellino's recent conviction in the Sardinian court did not involve conduct that would "reasonably be considered to be dishonest" based on information available to him at the current time. "The Football League will now consider the findings of the hearing." A deal for Cellino to take the majority shareholding of Leeds from GFH Capital first came to light on January transfer deadline day, at which point boss Brian McDermott was sacked, only to be reinstated a day later. Despite not owning Leeds, Cellino has continued to back the club financially, investing about £6m as the Elland Road club loses £1m a month. Cellino has held talks regarding a link-up with rival consortium Together Leeds, whose key figure Mike Farnan tweeted his congratulations to the Italian on Saturday. He will take on the role of president at United and will head up a new-look board. McDermott, speaking after his side's 1-0 loss to Wigan on Saturday but before Cellino's successful appeal was confirmed, said: "I will welcome the stability [if the takeover is approved]. The most important thing is Leeds United. "I would work with Massimo, but it is the prerogative of any owner to choose the manager he wants to work with. "We have to wait and see. From what I know he is a leader and has financial clout, which is something Leeds have not had for many years." McDermott, who recently said he received abusive calls from supporters, has seen Leeds drop to 16th in the table after a run of seven defeats in eight games. Leeds managing director David Haigh added: "I have met with many potential investors and worked closely with them, and I realised very quickly that Massimo is someone who has the attributes to take this club forward. "He has a proven track record in Italy, and I believe the introduction of Eleonora Sport, coupled with Massimo's drive and determination, will be key to a successful and sustainable future for this great football club."